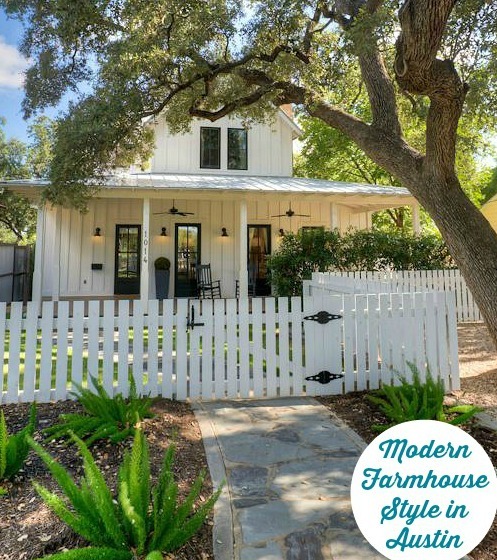 Architect Steve Zagorski designed this charming “modern farmhouse” within walking distance of downtown Austin. 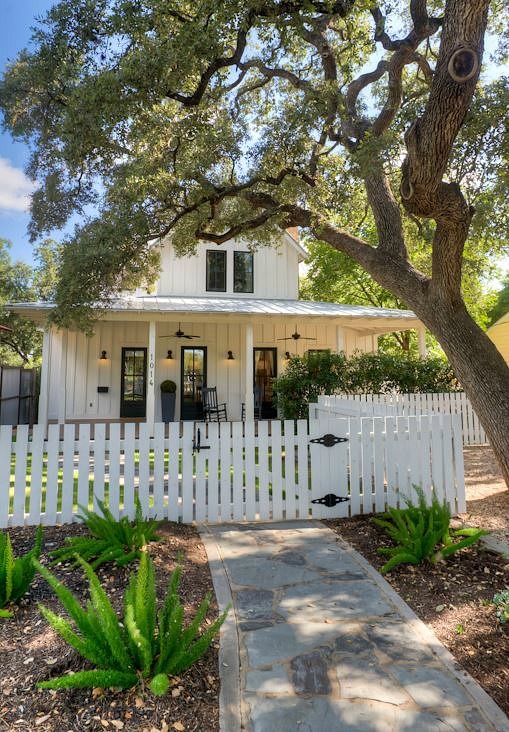 The listing for Milton House, as it’s called, says, “From its wraparound front porch to the giant old-growth Texas Live Oaks that shade the front and back yards, be prepared to fall in love.” Take a look! when people sat on their porches and chatted with neighbors. 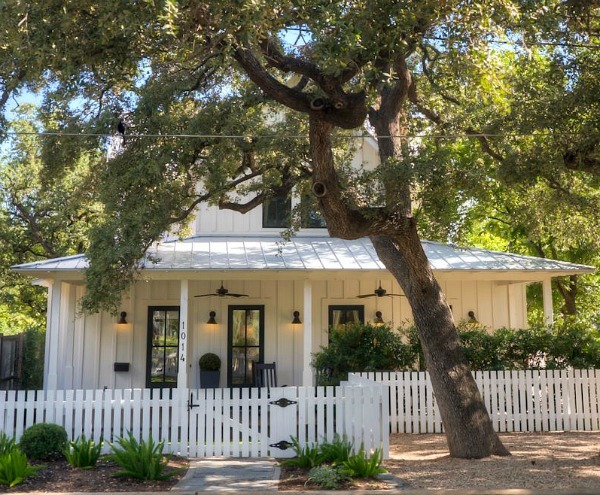 I love everything about it, from the white picket fence to the board and batten siding. The house has 2,750 square feet with 4 bedrooms and 3.5 baths. 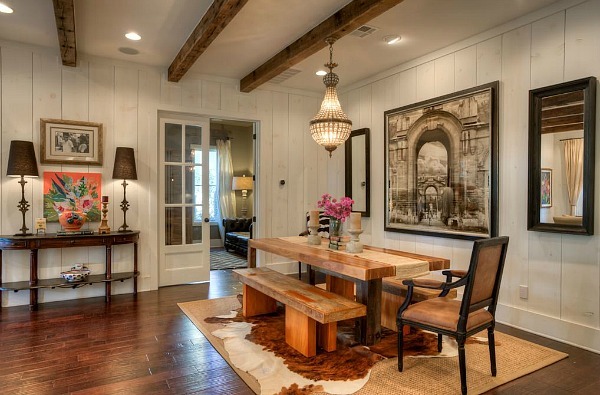 I love everything about this farmhouse. We put board and batten siding on our enclosed porch. It was vinyl and very heavy duty. So you can have it, without worrying about painting it! I love this! It’s a nice mixture of styles. 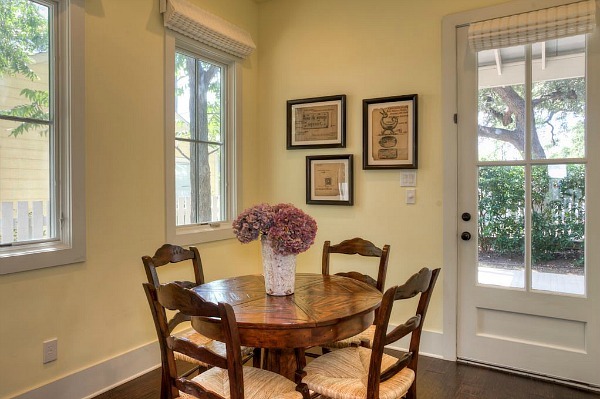 I see modern, French country, transitional and even artisanal touches in these spaces. I totally love the leather (hassock? ottoman?) in the living room. 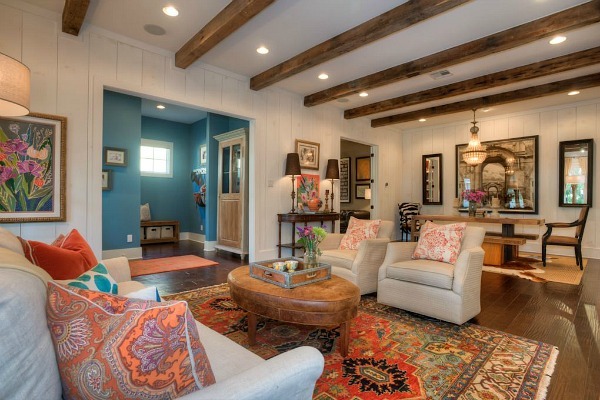 What a lovely mixture of blue, red, cream and purple; for a warm and cozy effect. Gorgeous! Forgot to mention, I really like the treatment they’ve done on the bedroom walls; sort of an aged look. I’ve seen this a few times recently. Think this is making a comeback, Julia? I’ve been seeing it more lately, too! It’s a beauty and I like everything about it, but for some reason I keep thinking it belongs in a coastal setting. Something about it reminds me of Key West or Savannah. I could see that, too! My dream house! Wow I love this. 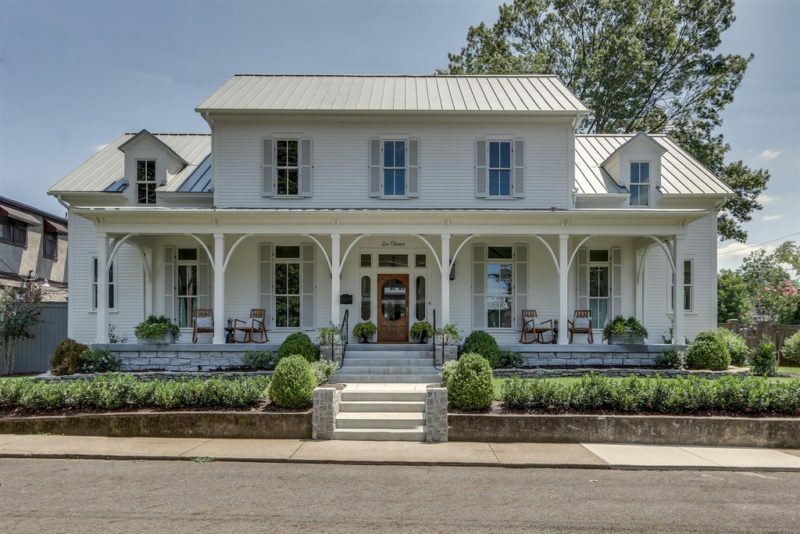 I’m drooling over all the fixed up farmhouses lately. Put this one on a couple acres instead of a city block and it would be perfect! 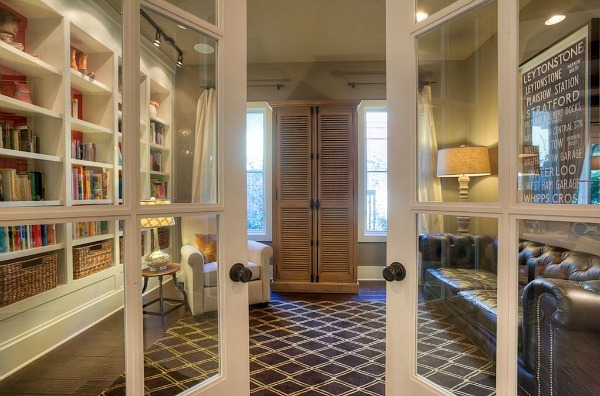 I could make myself real cozy in that study with all those bookshelves and those french doors. Yikes! I just noticed the price! Egads. Real estate isn’t cheap around here either but I don’t know that it would go for that here and we’re commuting-distance to NYC. 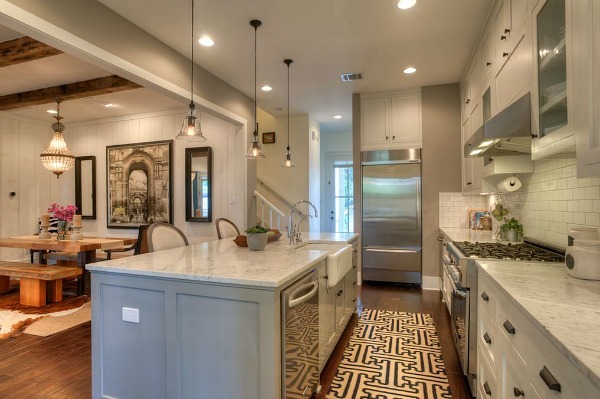 Love everything about this gorgeous new modern farmhouse but the price! Austin real estate isn’t cheap especially downtown. 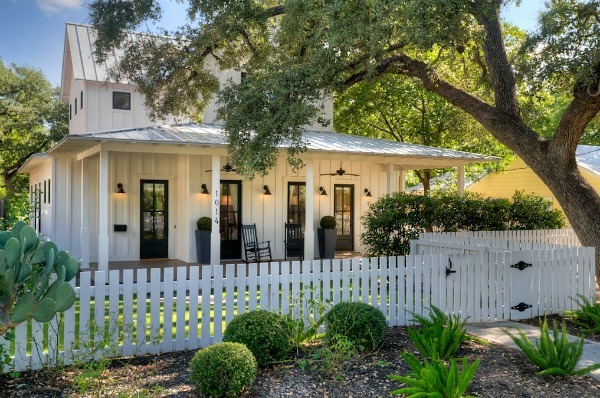 It does remind me of Chip & Joanna Gaines’ renovated farmhouse in Waco. 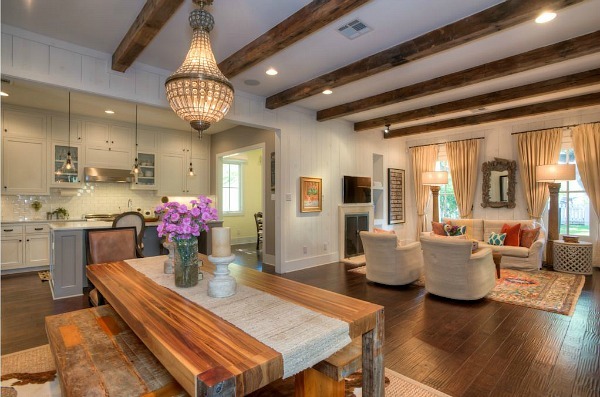 They do some amazing transformations every week on “Fixer Upper” but I do wonder if all the furnishings and décor she uses to style every home is just for the show? I cant image this is included with the home unless the homeowners have the option of buying some of the pieces she brings in. I am pretty sure it all goes with the renovation, all the furniture and decor, too. 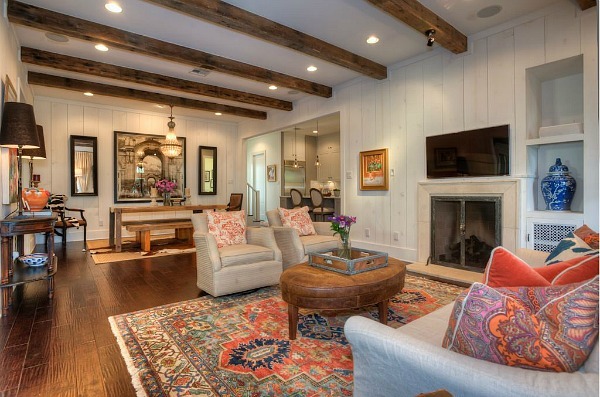 It’s cute, and I like the steel roof, but I’m not a fan of the undersized fireplace. Also, I like a defined front entry door and not sure where it is on the porch. I last painted my house about 20 years ago and it’s just starting to show signs of needing new paint in the future. Love it. I just wonder why they would be selling so soon after custom building it? I’d never want to leave, unless it was to the country. Admittedly, I know nothing about Austin real estate, but it seemed awfully high. Speaking of painted brick, we lived in our last house for 26 years and I think we touched up the paint twice ourselves. It was built in the 1920’s and had always been painted white. It’s fairly popular down here in the south. I love painted brick, and unless it’s an antique or specialty brick, or either a very old house or maybe a Tudor, I’d always want to paint it. My daughter, SIL and grandaughter live in the Hyde Park neighborhood in Austin and let me tell you, white siding must be a nightmare to keep clean. From the sparse grass and crumbly, caked soil/lack of rain, to the abundant trees shedding leaves and walnuts everywhere to the grackle birds and squirrels gathering in said trees, leaving their mess; a lot of maintenance is needed. Don’t get me wrong, I love Austin, its a beautiful place! I’m just saying that you’d be cleaning that gorgeous home, inside AND out. Love. This one is going in my daydream file. There is no detail of this house, other than some furnishings, I’d change. I could move right in today–which would be nice as I’m currently enduring my first Nebraska winter ;-). 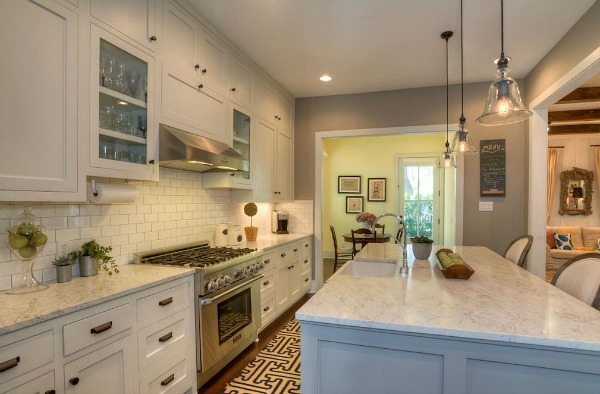 Very nicely done, great furnishings, nice kitchen. 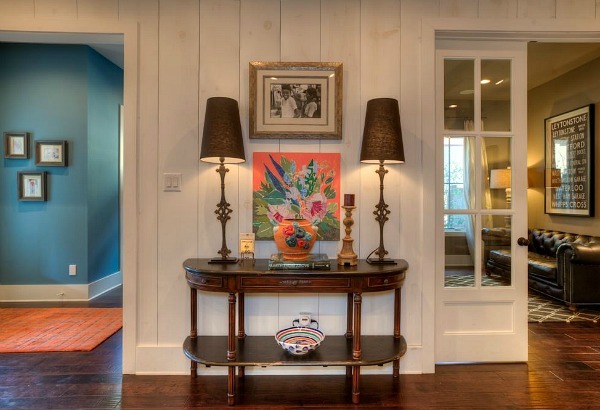 Just one thing I’d change, and it’s something that affects the whole character of a house: recessed lighting. It jumps right out at me every time. It makes a nice old or “new/old” house look like a commercial space. This is beautiful! 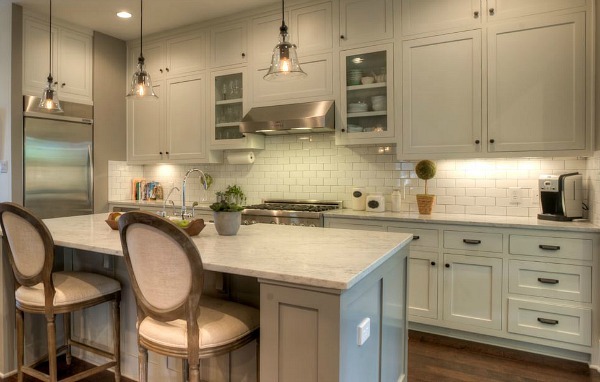 I love the fresh farmhouse feel and the only thing I would change is the “open” kitchen. I know that it’s the trend right now but I work full time and have 3 kids and I think it would bother me if the kitchen wasn’t spotless. I wouldn’t be able to sit and relax in the living room knowing there’s a sink full of dirty dishes. Oh, I really like this one. 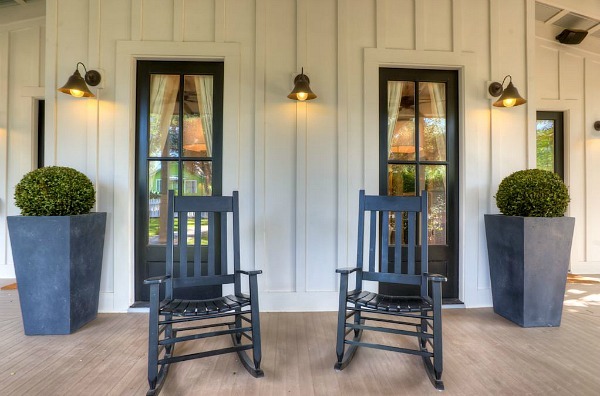 I could really enjoy those front porch rockers with a cold lemonade in had. 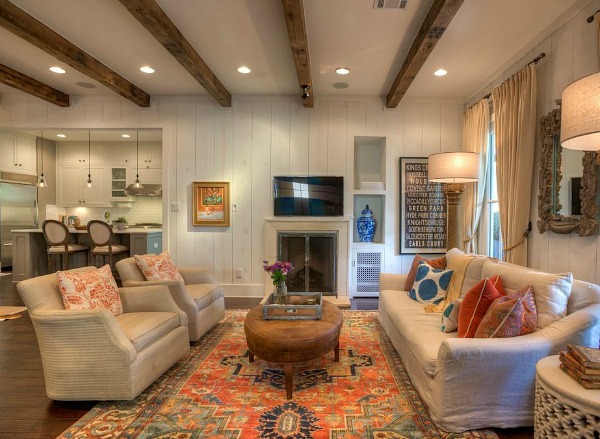 I love the metal roofing and that cozy den with all the floor-to-ceiling bookcases! I have Board and Batten siding on my Florida home that was built in 1982. If you love the look, I’d suggest instead of wood (which I have) or vinyl, look into Hardee Board (a cement board). I believe it comes in B&B or clapboard. We now have a bit of rotted wood siding that needs replacement. There would be MUCH less maintenance with a Hardee product, than with wood, and looks the same. great farmhouse, reminds me of uncles place in Ontario Canada. 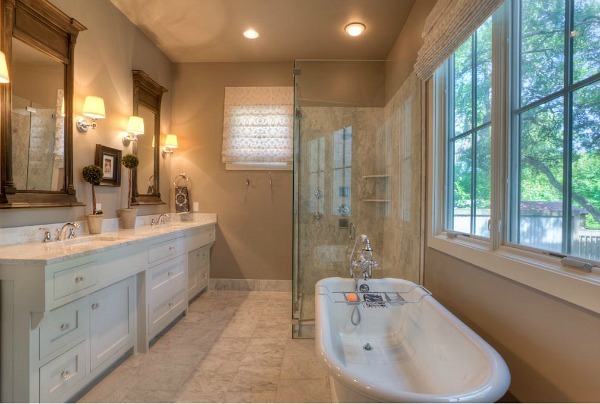 and thanks goodness, no useless, space wasting pedestal sink. Hmmm…I’m trying to figure out what you mean, Jean. Are you talking about a show on HGTV maybe? Julia, don’t tell Dave, but I would paint that red brick. I have a photo of a wonderful cape cod with red brick white washed, so some of the red shows through, and it is to die for. I have used brick halfway up my house, all hidden now with bushes, but I would love to whitewash it. 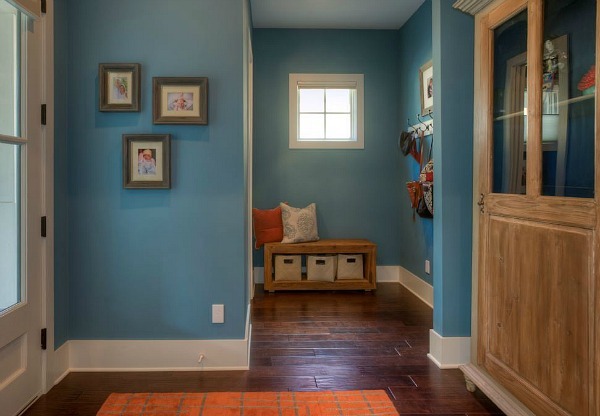 I absolutely love the blue paint in the entryway. Could you share what color that is & the brand of paint? Wish I knew — I like it, too! Beautiful house! I live in Austin and a white house is high maintenance due to our beautiful oak trees. 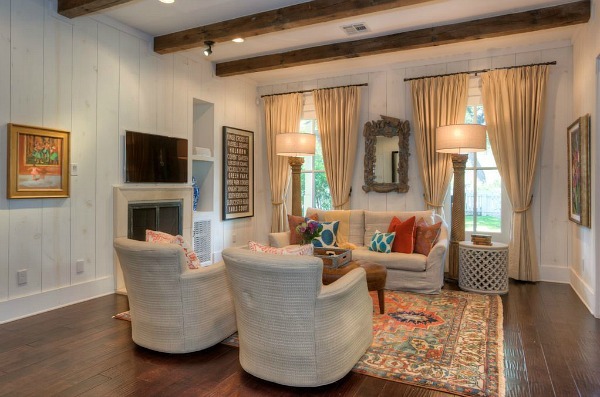 About painting brick, check out Cote de Texas post about brick homes being painted in Houston. I live in a brick home that I would love to paint given the opportunity, although my HOA would not approve. For them ugly brick is better than painted brick, LOL! I love your BLOG!! Hi Julia I would love a white picket fence but the husband does not like painting. I watched one of the Grand Design UK shows where the house was a cube shape, that’s not what got me it was pure white and the owner was adamant you did not have to repaint because the product they used self cleaned when it rained…know where to find such a product? This home is so pretty there was nothing that I didn’t like about it, just the thought on how to push the husband into painting it every now and then. Thank you for sharing beauty. Enjoy the weekend. Regards Esther from Sydney. PS I’ll join you on the porch with a cup or two of coffee/tea and I shall tell you how much I love Jack Lemon especially in The Great Race…the cake fight.. He is truly missed. My husband and I have talked about building a house with this kind of exterior. We are talking about using structurally insulated panels instead of wood. I think if you could use Hardee Board strips, it should go a long time with just using a hose with a sprayer. Julia, DO paint that brick! I love the look of whitewashed brick. I have some photos to send you of them if you like. I want to do it too but I would have to take out my front hedges to get to the brick on the lower part of the house.